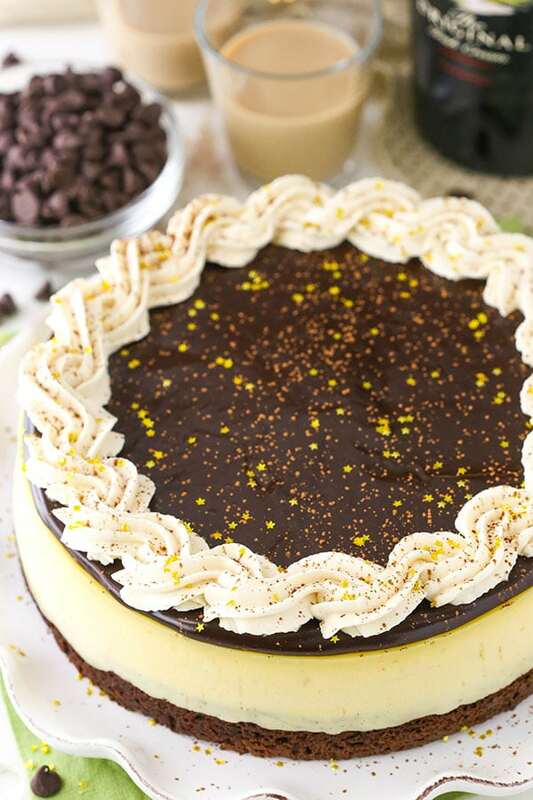 This Baileys Brownie Cheesecake is made with a dense, chewy chocolate brownie on the bottom topped with creamy Baileys cheesecake and finished off with Baileys chocolate ganache and whipped cream! 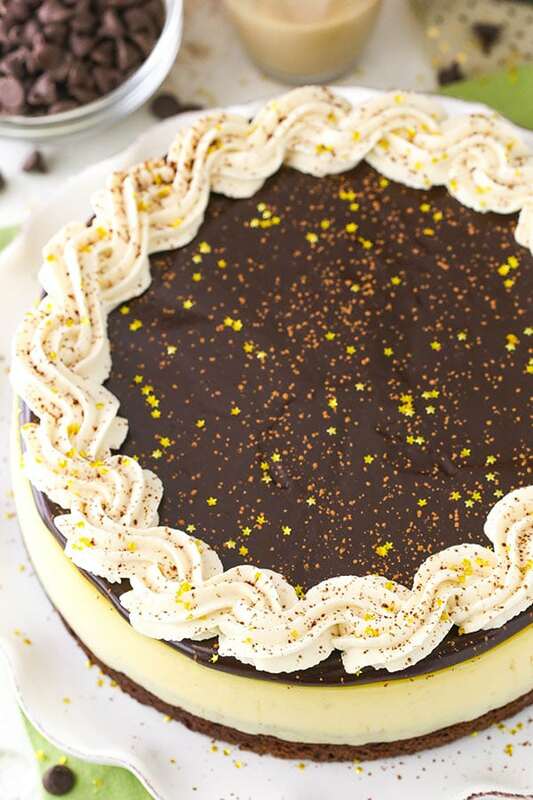 It’s all your Baileys dreams come true in one fantastic cheesecake! By now you know that I have a serious love of Baileys and baking it into things. The number of recipes I have using Baileys is a little insane. There’s even some Baileys in my cookbook. I just love love the smooth and creamy texture and flavor of it. There’s always some stocked in our cupboard. Well I have a layered cake, brownies, a poke cake, a mousse cake – and even mini cheesecakes – but no full sized cheesecake with Baileys. So I decided to fix that. And since I love giving cheesecakes a brownie bottom (like I did here and here), I did that with this cheesecake too. So many delicious layers! To get started you’ll want to make the brownie. Bake it in the same springform pan that you’ll bake the whole cheesecake in so that it’s the right size. Not all 9 inch pans are created equal. Once it’s baked, you’ll add the cheesecake filling on top – which by the way is full of half a cup of Baileys – and bake it all again. One of the questions I’m asked a lot is whether or not the brownie gets dry and the question is without a doubt a “no”. It doesn’t get dry AT ALL! The cheesecake filling insulates it and it stays super moist, dense and delicious! Now I like to try everything I can to ensure that the edges of this cheesecake don’t stick to the pan. To do that, I wash the pan after the brownie has been baked and before adding the cheesecake filling. Then I use baking spray to re-grease the sides. 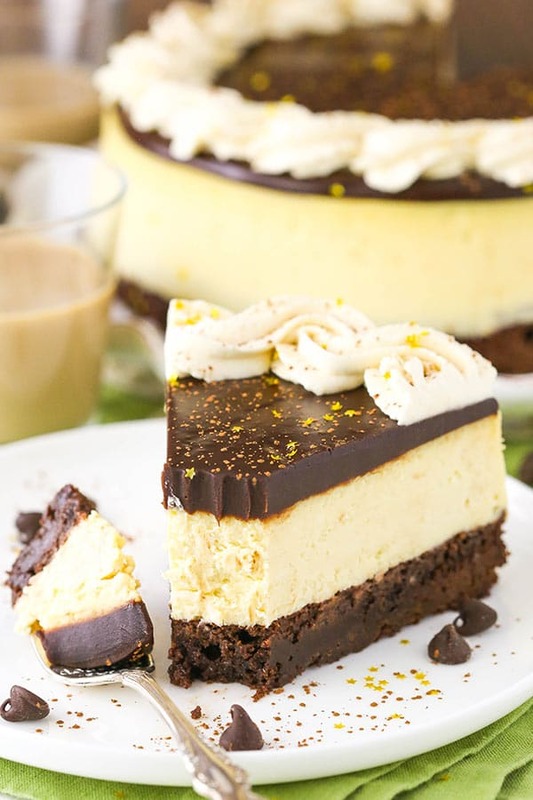 Then once the whole cheesecake has been baked and gone through the slow cooling process – before putting it in the fridge – I kind of tilt the pan around a little from side to side to let the cheesecake loosen from the sides of the pan a bit. It really helps! And just a side note – if you want to bake the brownie ahead of time and then finish the cheesecake later or the next day, you can totally do that. I love breaking up the steps if I can and doing it over a couple days. Once the brownie and cheesecake layers are baked and cooled, it’s time for the ganache topping! It’s also made with Baileys because duh! More Baileys! And then the whipped cream – more Baileys! 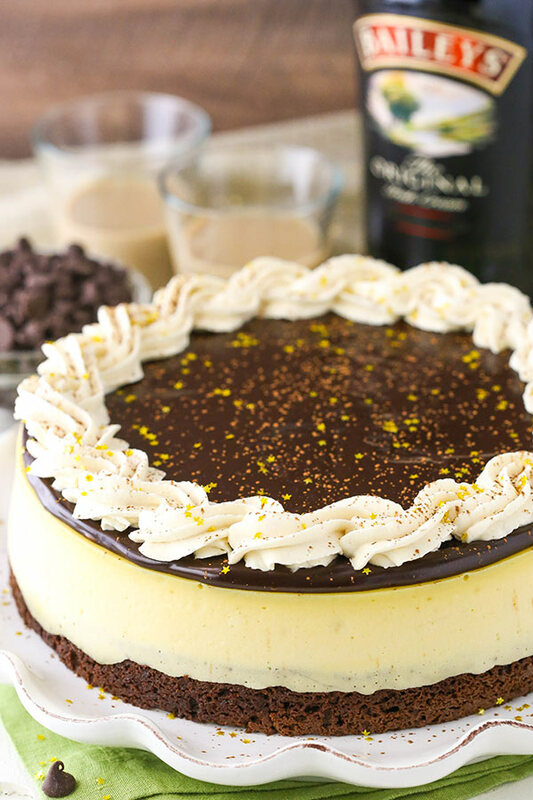 This cheesecake is full of Baileys flavor and plenty of chocolate for one of my very favorite combinations. It’s smooth, creamy, delicious and will surely be a new hit for you just as it was for us! 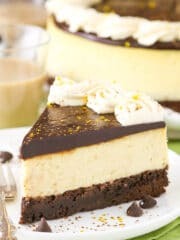 This Baileys Brownie Cheesecake is made with a dense, chewy chocolate brownie on the bottom topped with creamy Baileys cheesecake and finished off with Baileys chocolate ganache and whipped cream! 8. In a large bowl, beat the cream cheese, sugar and flour on low speed until well completely combined and smooth. Be sure to use low speed to reduce the amount of air added to the batter, which can cause cracks. Scrape down the sides of the bowl. 9. Add the sour cream and mix on low speed until well combined. 10. Add Baileys and vanilla extract to the cream cheese mixture and mix on low speed until well combined. 11. Add the eggs one at a time, mixing slowly to combine after each addition. Scrape down the sides of the bowl as needed to make sure everything is well combined. 12. When the brownie is done baking, reduce the oven temperature to 300°F (148°C). Remove the brownie from the oven and pour the cheesecake batter evenly over the brownie. 13. Wrap the outside of the pan with aluminum foil, then place the springform pan inside another larger pan. (See my tutorial for preventing springform pans from leaking. I also like to use a slow cooker liner.) Fill the outside pan with enough warm water to go about halfway up the sides of the springform pan. The water should not go above the top edge of the aluminum foil on the springform pan. 14. Bake for 1 hour 15 minutes. The center should be set, but still jiggly. 15. Turn off the oven and leave the door closed for 30 minutes. The cheesecake will continue to cook, but slowly begin to cool as well. 16. Crack the door of the oven for 30 minutes to allow the cheesecake to continue to cool slowly. This process helps prevent cracking. 17. Remove the cheesecake from the oven and water bath wrapping and refrigerate until firm, 5-6 hours or overnight. Once completely cool and firm, remove from the springform pan. 18. To make the ganache, place the chocolate chips in a small heat proof bowl. 19. Combine the heavy whipping cream and Baileys in a glass measuring cup heat just until it begins to boil. 20. Pour the hot liquid over the chocolate chips and allow to sit for 2-3 minutes, then whisk until smooth. 21. Pour the chocolate ganache onto the top of the cheesecake and spread evenly. 22. To make the whipped cream, add the heavy whipping cream, Baileys and powdered sugar to a large mixer bowl. Whip on high speed until stiff peaks form. 24. Pipe the whipped cream onto the top of the cheesecake. I used Ateco tip 844. 25. Sprinkle the top of the cheesecake with cocoa powder and/or sprinkles, if desired. 26. Refrigerate until ready to serve. Cheesecake is best for 3-5 days. Hope your little men are doing well! I love to look at your pictures, everything is so beautiful! I know this recipe is not a cake but is there a secret to frosting a cake so you don’t get crumbs in the frosting? I made a cake this past weekend and frosted it in the pan, but still had crumbs! Good thing that doesn’t affect the taste – ha! Thanks! Hi Suzanne! They are doing well – just turned 4 months! Lots of smiles from them these days. I have a tutorial for frosting layer cakes, in which you’d use a crumb coat to help with that. But it sounds like you might be talking about something more like a 9×13? My suggestion would probably be to drop spoonfuls of frosting over the top of the cake, then smooth that out. You won’t have to spread the frosting as far and it won’t pick up as many crumbs. Also, I really love using my 9 inch spatula for spreading. I really think it gives more control. I hope that helps! hi Lindsay, I was wondering if you thought the strawberry baileys would be good in this cheesecake? I have a bottle and not sure what to make with it. I haven’t actually tried any of the Baileys flavors. I’ve considered it many times! So I’m not really sure how much the strawberry flavor comes through and whether it’d make much difference. You could totally try it and maybe serve it with strawberries. What did you sprinkle on the top of this cheesecake?? Your cheesecakes are great!! My favorite is the peach one!! Thanks Shannon! Glad you enjoy them! It’s cocoa and sprinkles on top. 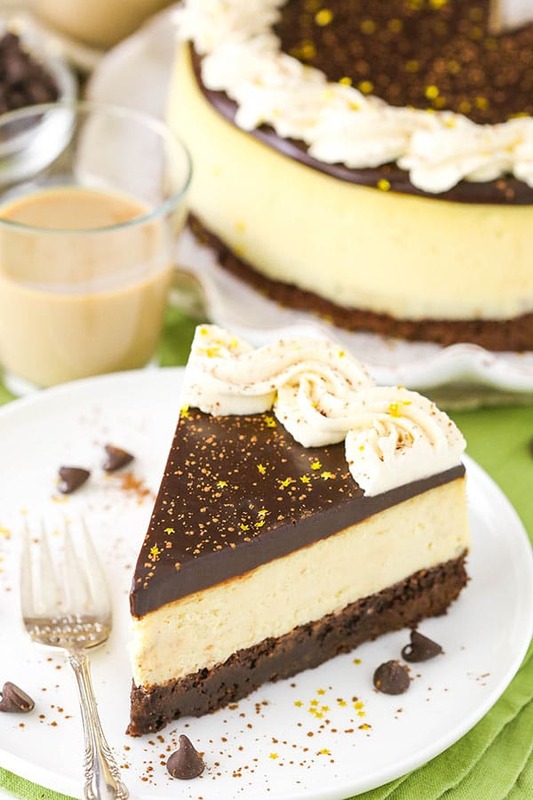 What a great idea to combined a brownie crust with a baked Bailey’s cheesecake filling! Pinned for late. 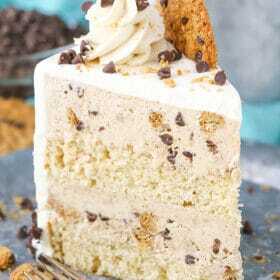 That is beautiful and must taste so yummy. I love the piping of the whipped cream! Can I substitute mascarpone for cream cheese 1:1? I know it is three times more expensive but the end product is definitely worth it. Thank you. I haven’t actually made a cheesecake with just mascarpone cheese, so I can’t say for sure. Hi Lindsay, this cheesecake looked so amazing that I just had to try making it. Well to my surprise it turned out very nice. I did do something different I added chocolate chunks to the brownie layer so that when you eat it there’s that little nugget of chocolate coming through, now the chunks did not get melty like I hoped that they would but the cheesecake still taste delicious and you can’t beat that Bailey’s flavor all through it. Thanks for sharing the recipe. The babies are adorable, as a grandma I could not help but love them so much. I’m so glad you enjoyed it! Thanks Henrietta! Hi. I am wondering if the Baileys is a coffee creamer or liquor, please? Hy Lyndsay, i have a bottle of bailey’s salted caramel. Can i replace the receipt with one this? Yes, you can. That would be delicious! If I leave out the Bailey’s would I have to up any of the other ingredients? I’d increase the sour cream to 1 cup and probably use 1-2 tablespoons of vanilla extract. Probably a dumb question, but I’m making this for my mom’s birthday…can my 11 year old daughter eat this? I know the whipped cream is a no but what about the rest? Does the alcohol bake out? I honestly don’t know for sure if it bakes out. That would be a personal call. Yes – in the cheesecake you can leave it out and add an additional 1/4 cup of sour cream. In the ganache, replace it with additional heavy whipping cream. In the whipped cream, leave it out and reduce the powdered sugar to 4 tablespoons. I have a 7″ cake dish. How long should I cook this for? I’m not sure – I haven’t baked any cheesecakes at that size. I would like to make as much of this in advance and freeze it. What parts, if any, can I make in advance and freeze? The brownie could be frozen in advance, but I haven’t ever frozen a fully baked cheesecake before to know just how well it does. If you tried it, I’d definitely leave the toppings until after you defrost it to keep those looking fresh. I made this for a fundraising auction. It was lovely. The only thing I fund was the ganache was a bit bitter so I added some sifted icing sugar to it. Made this for my sister in law for her Bday, and it was SOOO GOOOOD. Will make it again for sure. Thank you. I’m curious, does the brownie in this recipe get hard after the second baking (with cheesecake)? 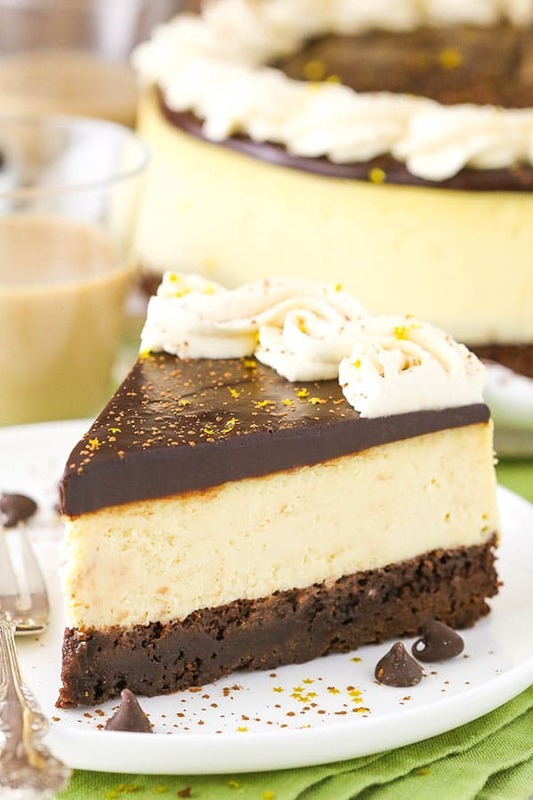 I’ve made a similar brownie cheesecake and for whatever reason, the brownie part gets hard. Is there someway of avoiding this? Let me know. Appreciate all that you do and have a good one!! Really want to buy your cookbook SIMPLY BEAUTIFUL HOMEMADE CAKES COOKBOOK! I am from UK and just want to clarify if ingredients are given in grams as well as cups, as I’m not familiar to cup sizing. Yes, the book has both! 🙂 I hope you enjoy the book! Can you tell me a substitute for sour cream in this recipe? Honestly, I think sour cream is best in any cheesecake. But if you really don’t like it, you could try using yogurt. Can I make this with a graham cracker crust? Awesome recipe! I have become a huge fan of Lindsay’s cheesecake recipes. I’ve made the Bailey’s, the Banana Cream, Turtle, Animal Cookie, and Red Velvet– each of them have turned out awesome! I’m a high school teacher and I always get lots of comments when I bring them to the teacher’s lounge. The credit should go to Lindsay’s recipes and instructions. Very easy to follow and almost completely fool-proof for a novice like me. Thanks Lindsay and keep up the good work! 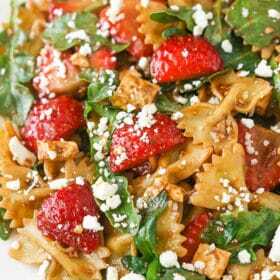 This recipe was fabulous for a dinner party! We really enjoyed the taste of this cheesecake. Warning…it’s rich so a small piece will make your taste buds love you! If you want to make it a little lighter try changing the brownie out with just a chocolate graham crust and I think you will enjoy it just as much.